Health insurance brokers are agents who are licensed and regulated at the state level. Brokers can help you navigate and enroll in plans through the Health Insurance Marketplace, or sell you policies from specific health insurance companies with their extensive knowledge and experience. 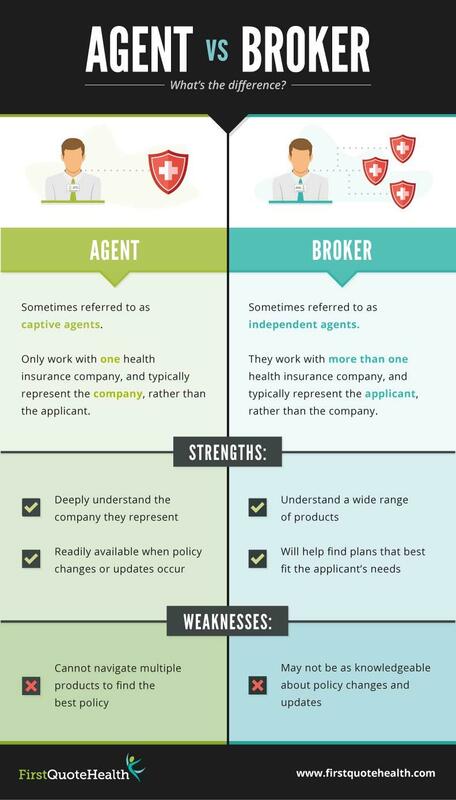 Should You Use a Health Insurance Broker? Yes, you should be using a health insurance broker (or health insurance agent) when searching for a health insurance policy. Navigating the Health Insurance Marketplace, or dealing directly with health insurance providers can be a confusing and daunting task. This is one of the most important decisions you will make in regards to your health and finances, so why do it alone? Because these professionals work with multiple insurance companies, they naturally have a great understanding of various insurance companies, how they operate and what kinds of services they offer. Unlike health insurance agents, brokers have the ability to save you money by searching across various plans available to you, where health insurance agents only push the health insurance company they represent. Naturally, you'll see a fair amount of variance in the abilities and practices of different insurance brokers. If you take your time and make a choice based on thoughtful criteria, this can make a positive difference for your finances and your health. You want to find a broker who is both knowledgeable and experienced, who is one who is willing to sell you the insurance you need at a price you can afford. While it is natural for an insurance salesman to try to upsell you when possible, definitely steer clear of overly aggressive sellers. Family members, friends, or professional acquaintances such as accountants whom you trust may have useful broker recommendations for you. If they are happy with their broker, chances are you will be to. Before making a commitment, don't be afraid to check any broker's qualifications for extra peace of mind. There is information readily available online, along with reviews. Start your health search today and see how much you can save by entering your zip code, or talk to one of our experienced agents right now 858-771-4087!